Depending on where you stand, social media algorithms are either the best thing since sliced bread or the bane of your existence. For the casual user who’s tired of sorting through dozens of Facebook posts from brands they followed five years ago and no longer care about, algorithms are amazing. For the social media marketer who’s reaching half the amount of their audience as they did five years ago, they aren’t so great. Unless you plan on throwing in the towel on social media completely, which would be crazy talk, adapting is the only real option. But not to worry, social media algorithms are nothing to be afraid of. We’ll show you how to succeed on social in a world where your reach is partially controlled by algorithms. What are Social Media Algorithms? Social media algorithms are a way of sorting posts in a users’ feed based on relevancy instead of publish time. Social networks prioritize which content a user sees in their feed first by the likelihood that they’ll actually want to see it. Before the switch to algorithms, most social media feeds displayed posts in reverse chronological order. The newest posts from accounts a user followed showed up first. This is still an option on Facebook and Twitter. Freshness is still a part of of the way content is displayed in feed. Most people don’t want to see Tweets from a week ago when they first open up the app. The difference is that social networks place more importance on showing you the newest content from the accounts you engage with the most. Social media flourished for years without algorithms, so why do we even need them? The answer you might hear from most marketers is that algorithms exist to push brands to pay for social ads. The theory is if brands can’t reach their audience organically, they’ll turn to ads instead, which earns money for the social networks. However, there’s another side to consider. There are a lot more users on Facebook, Twitter, Instagram and other networks than there were 10 years ago. 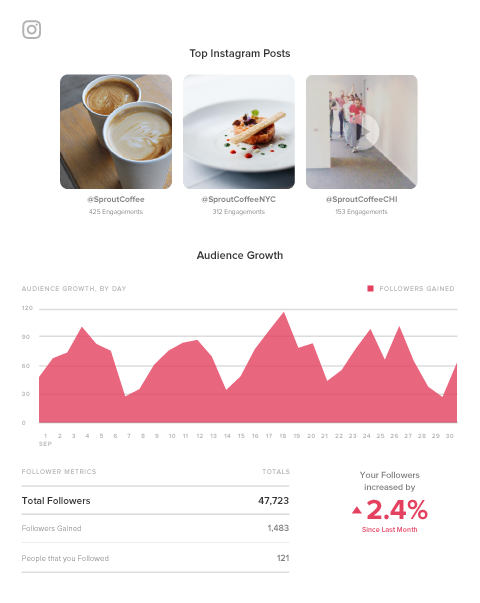 As a result, user feeds are packed with more content than ever. Social media algorithms are supposed to make it easier for people to see updates from the accounts they actually care about. You may follow dozens or even hundreds of accounts on Facebook. But you likely have certain accounts you enjoy more than others. Social networks are trying to figure out the best way to serve that content to you first. For instance, two brands I engage with a lot on Twitter are Sprout (you should be too) and AppSumo. So when I first open up the app, their Tweets tend to show up first, regardless of when they Tweeted. You can test this out yourself by liking, sharing and replying to a particular brand’s content continuously for a week. You’ll likely see their content show up at the top of your feed more frequently. The name of the game here is engagement. You need to show social networks that people actually enjoy the content you share. Otherwise you’ll continue to blend in and be overlooked by your audience. Alright, so here’s what you really came here for. What do you have to do to get more visibility for your social media posts despite all these algorithms? Here are some tips for success. As we mentioned, social media algorithms are primarily based on engagement. The more frequently people like, share and click your posts, the stronger correlation social networks will make between your brand and those users. Asking questions encourages people to reply or leave a comment. Hosting polls, Q&A’s or anything to get people talking to you is a great way to start. When you tag someone in a Tweet, Facebook or Instagram post, they receive a notification. Instinctively, they’re going to go check out your post to see why they were tagged. Once they arrive, they’ll likely engage with you by liking your post or leaving a comment. You don’t want to go around just randomly tagging people in posts that have nothing to do with them. But if you’re sharing an article, you can tag the author in it to credit them. Or if you’re sharing a piece of content you think a particular user would like, you could tag them and ask them to check it out. Notice how we tagged Marquette when sharing our case study. If people don’t resonate with the content you’re sharing, they’re not going to engage. Get strategic with your social media posts and make sure it’s aligned with a target persona. Sprout’s organic post targeting can be extremely helpful here. Our publishing tools allow you to target your posts based on audience demographics, location and other filters to make sure your content is reaching the right people. Start by segmenting your audience. This could be done based on their demographics, the way they use your product or any other way that makes sense. 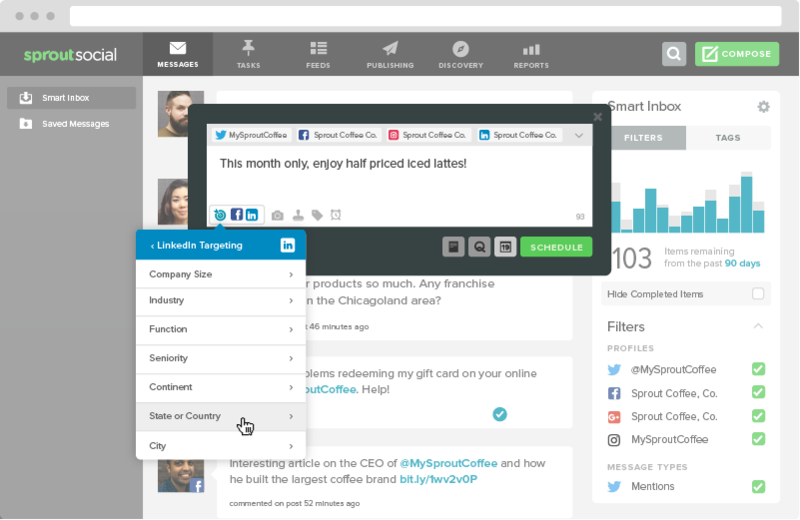 Then when it’s time to create your social media calendar, match your posts to one of your audience segments and start sharing. When Instagram announced it was going to start using an algorithm in their feeds, there was a surge of content creators and brands asking followers to turn on notifications for them. While notifications are great for brands, they can be annoying for users if they have notifications turned on for dozens of accounts. Because of this, people won’t always turn on notifications for your posts, but it doesn’t hurt to ask. One of the easiest ways to rise above social media algorithms is also the simplest. You can just ask your audience to like, share or comment on your posts. Get in the habit of including CTAs in more of your social media posts to compel people to engage. The more frequently you can get people to engage with you, the more likely you are to show up at the top of their feed. Use social media analytics to find out what’s working well, then replicate the results. 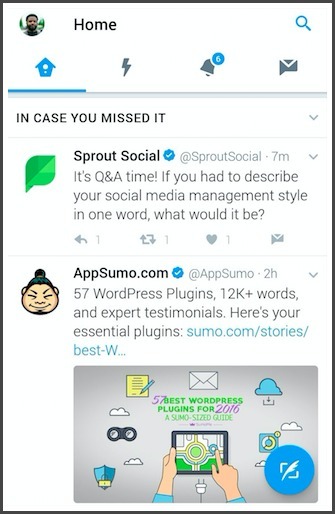 Sprout’s reporting shows you your top performing posts across all your social media channels, as well as details on optimal posting times and more. Last but not least, the most obvious solution is to run social ads. It’s one of the best ways to guarantee your content will at least be seen. Facebook, Twitter, and Instagram all have options to allow you to promote or “boost” your posts. This makes it so your content shows up in feeds just like organic posts. The difference is they’ll say “promoted” or “sponsored” in order to distinguish them from non-paid content. If you have the budget, test social media advertising to increase the reach and and engagement of your posts. Start with content that has performed well organically and use social media advertising to amplify it. Algorithms aren’t the end of organic social media marketing. They’ve just shaken things up a bit, and marketers just have to adapt. Start by understanding how the Facebook, Twitter and Instagram algorithms work. Then work on getting people to engage with you. Use the tactics above to rise above social media algorithms and reach more of your audience.